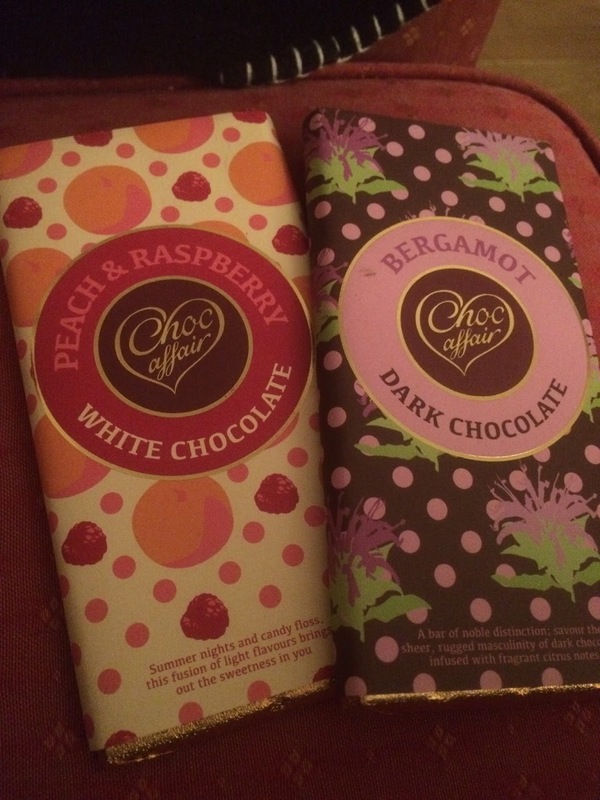 While we were exploring the lovely huge farm shop recently we found a few interesting finds, top of the list being these two chocolate bars. I know I can get choc affair more locally, but I'd never seen such a wide range and really fancied these two. First up we have the Peach & Raspberry in creamy white chocolate. I wasn't entirely sure how the peach would go with this, but like recent lemon chocolate bar explorations these all went really well. Probably my favourite of the two - and when shared around the one that the went the fastest. Its got quite a light flavour, quite sweet and with less bits in than my normal preferred chocolates but I'd buy this again, and haven't taken it in to work - instead choosing to guard it jealousy and eat in secret. The bergamot sounded like a fun idea - earl grey chocolate is essentially what this is. It's got no bits to speak of, just a delightful blend of very dark chocolate and the fruity notes of the bergamot. This is far more of a savouring chocolate than a snacking chocolate, and a couple of chunks per sitting is perfectly adequate. I may take this one in to work so that others can sample it's delightful sophistication. Choc affair is a brand that is yet to let us down, and always produces flavours that are interesting enough to seek out and pick up as impulse buys. As ever the packaging is suitably luxuriant so these would be suitable as small thank-you gifts and a little more personalised than the usual box of chocolates with centres.